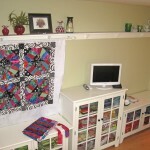 Some of the more popular quilt patterns that QuiltWoman.com carries are the ones in our Straight-to-the-Point (STTP) Series. The creative force behind these quilts is Susan Mayer. Curious to know more about these quilts and Susan, I picked up the telephone and gave her a call. I asked Susan how the STTP series started. She stated it was “quite by accident.” Susan was teaching classes in which she used a lot of other designer’s patterns. She thought to herself “I can do this” and proceeded to pull out the graph paper to design her own quilt. Her intent was to create an “amazing sampler quilt”. But when it was finished it was, to use Susan’s words, “ugly.” She didn’t want to redo or redraw it, so she got out scissors and tape, cut the design on the graph paper apart, taped it back together, tried a few other cuts and realized the result was “on point”. Susan then executed the design in fabric, and it worked there also! Thus the Straight-to-the-Point concept was born. You can read an explanation of the technique here. But how did Susan end up publishing her patterns? She was teaching a mystery class based on this new quilting concept. Her students were working along and hadn’t quite noticed that what they assumed to be the finished project was an odd size. One of the speedier students announced “I’m finished”. But she had a puzzled look on her face, having realized her quilt was an odd size. The student asked Susan for help with the borders. Susan played along and “admitted” that the quilt didn’t turn out the way she thought it would. Susan told her, “Tell you what, let’s go to the big cutting table and see what we can do.” The student about died…“Are you going to cut my quilt?” Susan assured her she could fix it. The student was skeptical and reluctant until Susan offered to pay for her fabric if she ruined it. So out they went to the cutting table and Susan made one cut. Susan mused “Hmm, that didn’t get us anywhere.” She made another cut, flipped the pieces around, and Viola! A quilt on point! At that point (pun intended), all the students got excited at seeing the end result. Cut away, students! Since that fortuitous meeting, Susan has published 21 STTP patterns and 13 traditional ones. And to think this all started not that long ago in 2006. That first quilt was Do-Si-Do. After that, Susan collaborated with Ann to come up with Contra Dance and Dance Partners. Below is Contra Dance. This sample was created with the “You Go Girl” fabric line by Northcott Fabrics. And this is Dance Partners. This sample was made with the “Town & Country Flannels” fabric line by Northcott Fabrics. I remarked to Susan that some of her newer samples are full of bright colors. She calls them clear colors. Those are not to be confused with dusty colors. Ok Susan, spill…what are you talking about? A clear color is one where your eye doesn’t have to pick through the contrast and values to see the design. The design just shows up! Pair it with a black and white fabric and the colors pop. If you are working with dusty colors, your eye had a hard time distinguishing between the pieces. A quilt made with dusty colors can blend too much. Kaffe Fassett’s fabric works the best. Still confused? Susan distilled it down to this. A dusty color is a muted color; it has a little bit of brown or gray value to it. Look at white versus a cream. The white is clear, the cream is dusty. One of her newest patterns is Floral Path. Susan described it as a simple quilt, one that will give the quilter a “feeling of instant gratification” because it will go together so quickly. That is something that works for Susan. She has found that when she is working on a quilt, designing it, picking the fabric and piecing, about halfway through and her mind is already on the next design! A couple of Susan’s other new patterns are Side Stepping and Fire and Ice. She thinks they will appeal to quilters because of this same concept of instant gratification. I always have to ask a designer how he or she generates their designs. 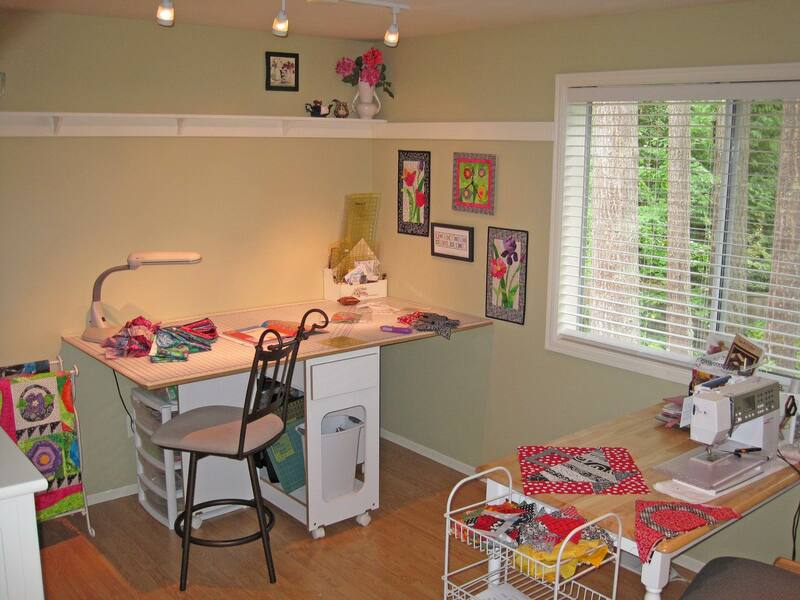 Knowing that Susan started this journey with a design on graph paper, I asked if she still designs that way. 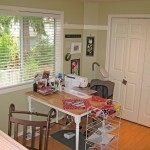 “I do a combination, some graph paper and some on Electric Quilt 6 (EQ6). If it is a totally original design or concept, she will start on graph paper. If the design is based on a traditional block that can be found in EQ6, she will use that. I inquired if Susan has any formal training in the arts or a similar field. She has none whatsoever! (There is hope for those of us who also don’t!) She used to work with an interior designer doing store displays, so she was used to putting colors and different patterns together. She also did custom floral designs; again she is experienced using colors. 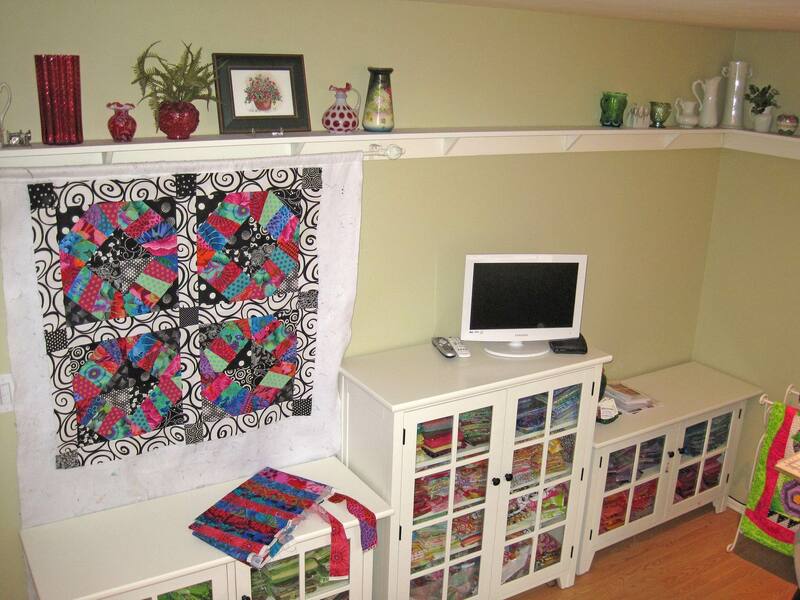 We posted some pictures of Susan’s Quilt Room a few weeks back (see them here), and some people wanted to see what her sewing room looked like. Well, here it is. 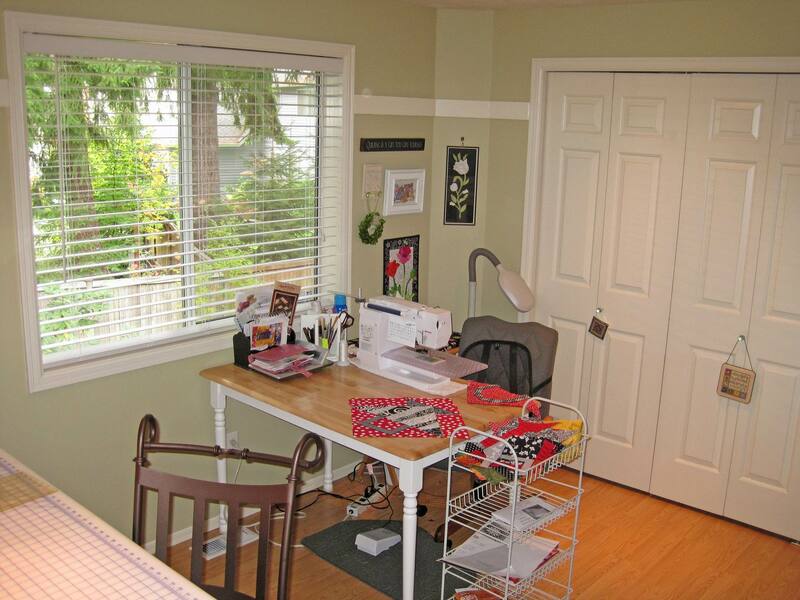 Very glad that Susan couldn’t see the state of my own sewing room, I asked “Is your sewing room always that clean?” “Yes, my Studio is occasionally messy, but I do try to clean it in between projects.” I’m envious, not only is it a studio and not a sewing room, but it’s clean. 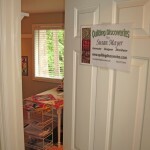 Susan remarked that she is lucky to have the two rooms (her Quilt Room and her Studio). The quilt room originally “was just a room.” Susan decided she needed to have the quilts out so she and others can enjoy them. Most of them fit into the room. I was curious as to what sewing machine Susan uses. It is a Bernina aurora 430. She bought it because of the BSR (Bernina Stitch Regulator). 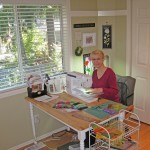 Susan did admit she doesn’t do any machine quilting but does her own piecing. She just doesn’t enjoy the machine quilting (she is mortal after all!) Susan found a quilter who does beautiful custom work, she just hands the quilt top over and doesn’t even have to tell her machine quilter what she wants. Having seen Susan’s quilts in person, I can attest to that. What’s ahead for Susan? If you look in Fabric Trends Magazine on page 11, the Do-Si-Do pattern is featured for Northcott Fabrics. She has a free pattern available from Clothworks for their Midwinter’s Garden Black and White line. 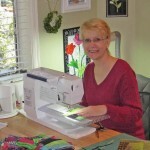 In addition, Susan is hoping to be at the Spring 2010 International Quilt Market in Minneapolis. 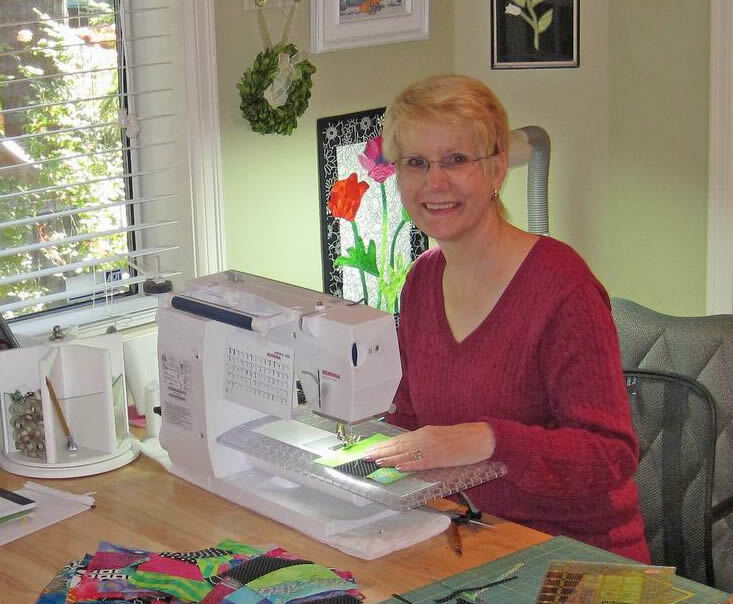 Susan does teach, present trunk shows and guild presentations. She is more than willing to travel! You can get more information about where she’ll be and when at on her website. 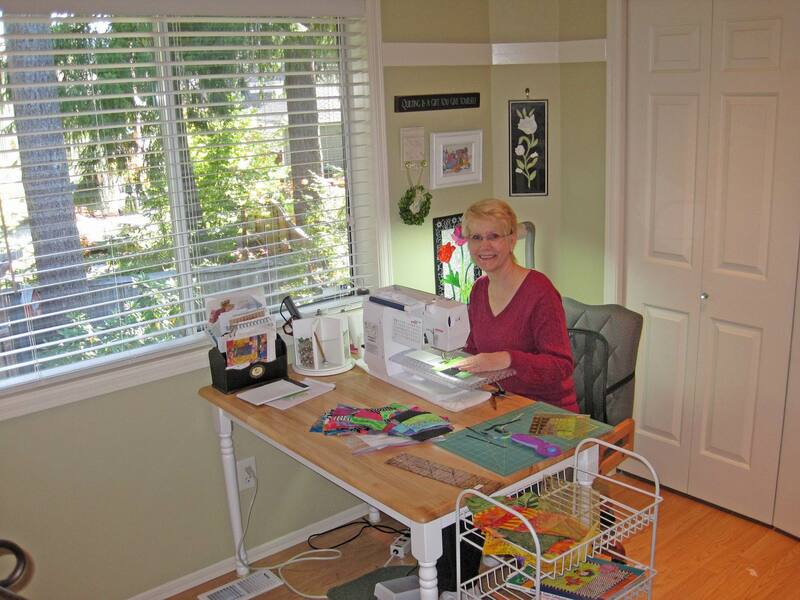 Susan is located in Washington State, having relocated within the past few years from San Jose, California to be closer to her daughter and grandchildren. 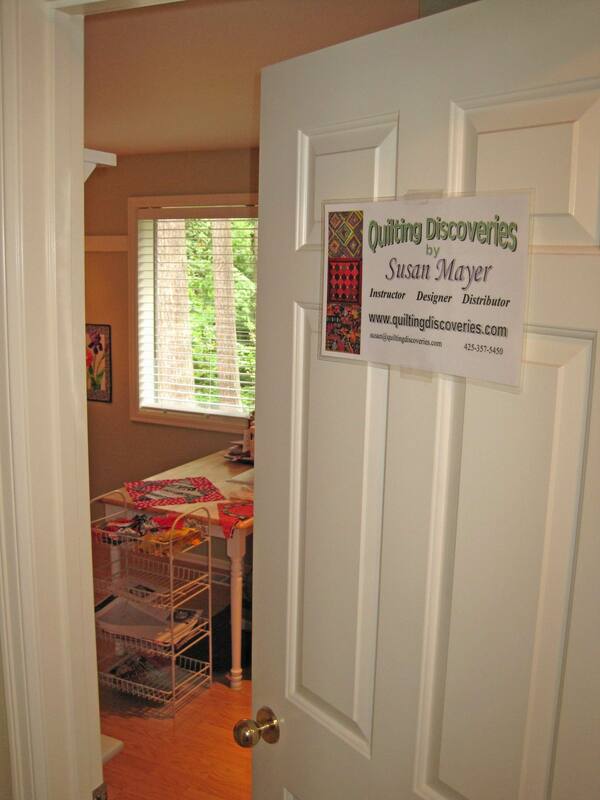 This entry was posted in Designers and tagged Straight to the point, Susan Mayer. Bookmark the permalink.